My Guys Moving & Storage is a family-owned and operated business that is excited to offer our top-notch local moving services to the Tidewater area. Our friendly, courteous staff has more than 25 years of combined moving experience that we offer the Hampton Roads area from our office on Taylor Farm Road. Our pricing structure is simple: just an hourly rate, plus a trip and fuel surcharge, and we have an ample number of storage containers in case you need some belongings stored for days, months or even years. If you need a specific estimate, just fill out our online form, or give us a call and talk with a moving expert. Local Move Time – starts when we arrive at your loading location and continues until work is completed at your final destination, including travel time between locations. You initial this time when we start and when we stop. Trip Time – usually an additional hour, is added to the account for the time spent getting to your destination and then back to our office once the move is finished. Packing-Supplies – we have all packing supplies on hand which we can bring with us on pack/move day. Liability Coverage – we provide standard movers liability coverage of $0.60 per pound per article up to $50 per article. We offer full value protection as an upcharge. Call for details as price depends on move size and deductible selected. Loading and Packing Time – we generally say that it takes one to one-and-a-half hours of moving time per fully-furnished room. However, it can take longer if you live in a location with multiple staircases, elevators, or if there is a long walk from where the truck can park to the door. We do not do smaller local moves. We focus on long distance movers – interstate and intrastate moves. If you have a large move we will handle it from our Richmond office. Have legal questions about our Bill of Lading? You can read the .pdf version right here. 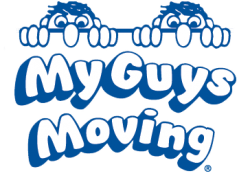 My Guys Moving & Storage is a member of Move for Hunger, a non-profit organization of movers who donate non-perishable goods to local food banks. When you book with us, just ask for some of our specially marked boxes for any non-perishable foods you wish to donate. Our movers will bring the boxes with them and then deliver them to the local food bank once they have finished your move. Even if you’re not moving with us, please consider making a donation to help us fight hunger in the community. We require a security deposit to secure the date and time of your local move. For your convenience we accept checks, cash, and any major credit or debit card, including Visa, MasterCard, American Express, and Discover.